Simon & Schuster, 9781476728827, 864pp. With a new introduction by the authors, this is the classic account of the American statesmen who rebuilt the world after the catastrophe of World War II. 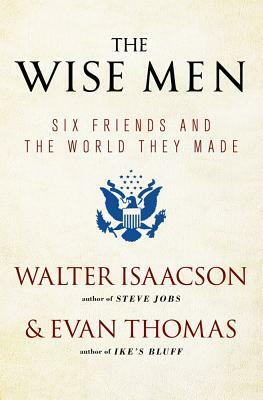 A captivating blend of personal biography and public drama, The Wise Men introduces six close friends who shaped the role their country would play in the dangerous years following World War II. They were the original best and brightest, whose towering intellects, outsize personalities, and dramatic actions would bring order to the postwar chaos and leave a legacy that dominates American policy to this day: Averell Harriman, the freewheeling diplomat and Roosevelt’s special envoy to Churchill and Stalin; Dean Acheson, the secretary of state who was more responsible for the Truman Doctrine than Truman and for the Marshall Plan than General Marshall; George Kennan, self-cast outsider and intellectual darling of the Washington elite; Robert Lovett, assistant secretary of war, undersecretary of state, and secretary of defense throughout the formative years of the Cold War; John McCloy, one of the nation’s most influential private citizens; and Charles Bohlen, adroit diplomat and ambassador to the Soviet Union. Evan Thomas is the author of The Very Best Men: Four Who Dared: The Early Years of the C.I.A. ; Robert Kennedy: His Life; The War Lovers: Roosevelt, Lodge, Hearst and the Rush to Empire, 1989; Sea of Thunder: The Last Great Naval Command, 1941-1945; and John Paul Jones. His most recent book is Ike’s Bluff: President Eisenhower’s Secret Battle to Save the World.